The Grand Mass in E-flat Major, Op. 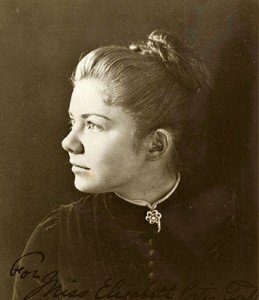 5, put Amy Beach on the map, “among the foremost rank of American composers,” as one critic wrote after the premiere of the 1890 work, by the Handel and Haydn Society two years later. So why has it not entered the repertoire? That Beach was American and female are obvious obstacles. But while the piano-vocal score was published even before the work’s performance, the performance materials—full score and orchestral parts—were never engraved and published. I had looked over the piano-vocal score some years ago, and I liked the work. Then, two years ago, when we changed our name to the Commonwealth Chorale, we thought that we should start to feature some Massachusetts composers. And one of our members came across an article about the new edition of Beach’s Mass by Matthew Phelps. Because the orchestral score was never published, the materials in use have been copies of the manuscript score and parts from the 1890s! Phelps’s edition will be published by A-R Editions, but he agreed to let us perform it prepublication; we are the first ensemble to use it. And on top of that, there’s the 150th anniversary of Beach’s birth. So everything fell into place, and it’s all coming together very well. We are very excited! I was searching for a dissertation topic, and I read an article in the Choral Journal about a new edition of John Knowles Paine’s Mass. And at the end it said something like, another work sorely in need of an edition is Amy Beach’s Mass, Op. 5. I knew some of Beach’s music, piano works, and some sacred choral works. So that’s how I decided to edit her Mass. It’s been a big project, and really fascinating. I hope this edition will help to give the work some legs! In addition to being the 150th anniversary of Beach’s birth, it is the 125th anniversary of the Mass’s premiere. 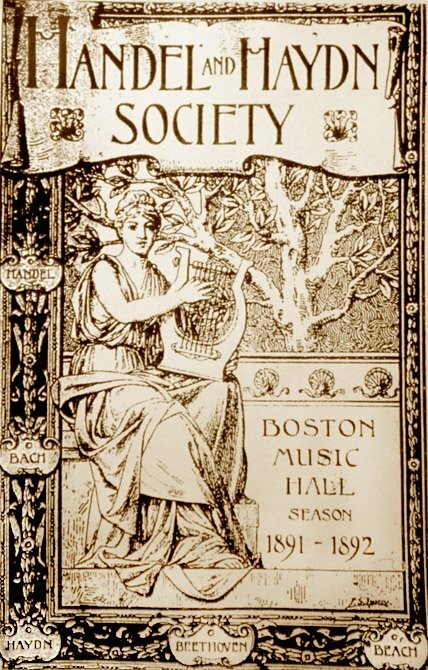 The program cover for the H+H booklet for the 1891-’92 season placed Beach in the company of Bach and Beethoven as well as Handel and Haydn. Beach’s biographer Adrienne Fried Block suggests that Beach might have been influenced by performances of Luigi Cherubini’s Deuxième messe solennelle, performed by H+H in 1893, as well as Bach’s B-minor Mass, which they gave in 1887. Amy would have studied both these works and attended the performances with scores in hand. But the serene austerity that we hear in the Kyrie of Beach’s Mass is distinct, and indicates the originality of her composition. Beach studied the works of others to develop her mastery of the musical language, but her use of that language—from the expansively sculpted, soaring melodies to the rich and sumptuous harmonic colors—results in a compelling musical expression. Block also mentions that Beach was part of a composing tradition, where a Mass serves to “demonstrate skills, to create the masterpiece that placed them in the company of master composers,” mentioning Bach and Paine as writing settings of the Mass although not part of Catholic tradition. For Beach, creating a Mass was as well an opportunity to immerse herself in the religious practices of her husband, who had served as a choirboy at Church of the Advent, which was part of the Oxford Movement that called upon the Anglican church to return to the richness of the Catholic liturgy. Although the Beaches’ wedding took place at Trinity Church (with the Rev. Phillips Brooks officiating), the Beaches would attend Church of the Advent. For Amy, coming from a Congregational and Baptist background, the Episcopal liturgy was something new, and to steep herself in the Latin of the Ordinary of the Mass (plus the Graduale movement added to provide a solo for the star tenor) was not only a musical opportunity but also a spiritual learning experience, one that would help her understand the world of which her husband had long been part. Soprano Dana Lynne Varga, mezzo Vera Savage, tenor Matthew Anderson, baritone Sean Galligan, with the Commonwealth Chorale and the New England Philharmonic, David Carrier music director. Ticket information. I was privileged to hear the dress rehearsal, and fortunate enough to sit with NEPhil conductor and colleague Richard Pittman, the score on a stand. This is one of the most beautiful pieces I’ve heard in a long while. The solo lines are sumptuously set, and the orchestral work is beautifully colored. This is the work of a master, and deserves to be in the standard canon.